Just past his 90th birthday, British Columbia-born artist Joseph Plaskett says his work is just reaching its maturity. 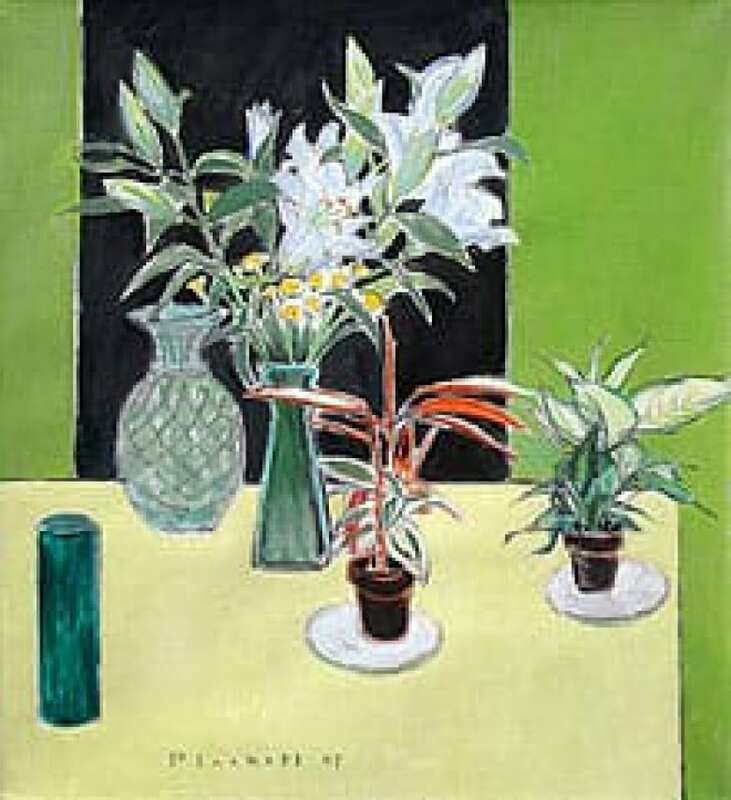 Still Life on Rectangles is a 2007 oil on canvas by Joseph Plaskett. The artist says he looks at a painting for days or sometimes years before he realizes what will make it better. (Joseph Plaskett/Bau-Xi Gallery) (Joseph Plaskett/Bau-Xi Gallery) As he passes his 90th birthday, British Columbia-born artist Joseph Plaskett says his work is just reaching its maturity. "After 70 years of professional painting, I feel I'm beginning to be a great painter," he told CBC News in an interview aired Tuesday. He's celebrating his longevity as a painter this month with seven simultaneous exhibitions across Canada, including one in Vancouver and two in Victoria. Plaskett said he still works at creating the effect he wants in his work. "If you stay with it long enough you can usually solve a painting," he says. "You reach a point where you think that it's wonderful — you may think it's wonderful a day or two or a week or two or sometimes even a year or two and then you suddenly see what's lacking." He draws inspiration from studying the romantic impressionists who have always inspired him — he says he currently keeps a book of Van Gogh paintings close at hand — but also from his contemporaries working in everything from abstract painting to sculpture. "I think any artist has to be overcome with pleasure and pride in the beauty of other people's art. You can't just make it what you think is beautiful," he said. Born in 1918 in New Westminster, B.C., Plaskett studied art in Banff, San Francisco, New York, London and Paris. He has lived in Paris since 1951, and more recently in England. 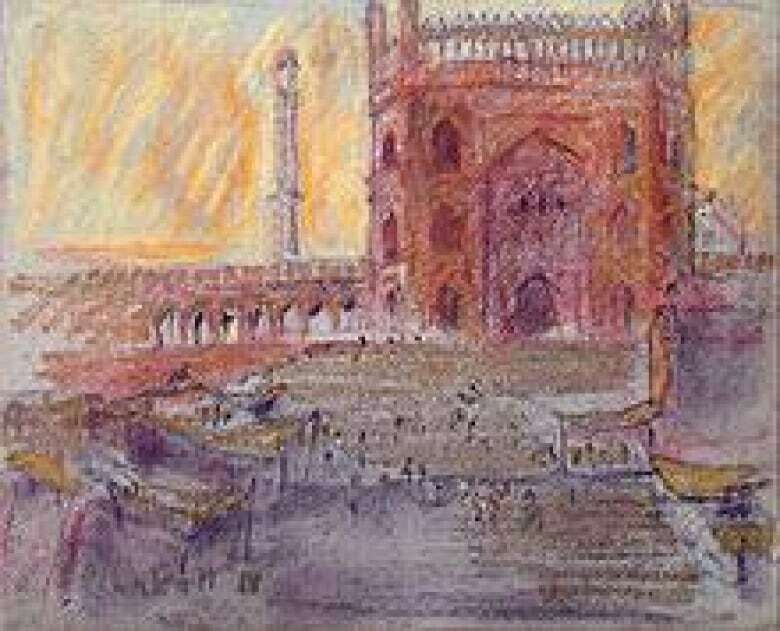 Red Mosque, Delhi, 2b is a 1988 pastel on paper by Joseph Plaskett. The artist says studying abroad as a young man had a huge influence on him. (Joseph Plaskett/Bau-Xi Gallery) He first went abroad to study in 1947, eventually spending time with Hans Hoffman in New York in 1947. It was Hoffman who helped turn him toward realism, even though Hoffman was an abstract artist. "If it had gone another way, I might have ended up as an abstract painter. Because Hoffman insisted in his teaching that it be based on what you see — we always worked with a model, and because of that I never made a success of being an abstract painter," Plaskett said. "When I went to Paris I was so enchanted with the beauty of the old world — what was left of it after the wars — that I just had to surrender myself to my rapture at seeing what was in front of my eyes." Plaskett admits painting has been good to him and he's never had to struggle to survive on his art. Since the 1940s, he has had more than 65 solo and group exhibitions and sold work to major public, private and corporate collections. He has had shows in Halifax, Fredericton, Victoria and Ottawa. He's faced criticism for sticking with realism when his more daring contemporaries are doing more conceptual work, but he said people have always liked his work. "I admire abstract painting — I can see all its beauties. And a lot of abstract painters, the most rigorous like Mondrian, have influenced me a great deal, but when it comes to influence, it's perhaps more realistic painting," he said. His success led him to form the Joseph Plaskett Foundation, which every year gives an award to a young Canadian painter so he or she can study abroad. "I owe so much in my art to the experience of Europe that I want to pass it down to others," Plaskett said. His work can be seen this month at the Bau-Xi Galleries in Vancouver and Toronto.